New Delhi, Aug 16 (IANS) The report that said Rohith Vemula was not a Dalit and that his suicide was not a result of any political and administrative discrimination was dismissed by the JNU Students’ Union (JNUSU) on Wednesday as “stupid” and just another act in a series of “manipulatory tactics” by the Centre. A one-man Commission, constituted to look into the suicide of Hyderabad University scholar Rohith Vemula, came up with its findings on Tuesday stating that the scholar did not commit suicide because of any pressure exerted by Union Ministers Smriti Irani and Bandaru Dattatreya or university’s Vice Chancellor Appa Rao Podile and that it was a decision “of his own”. 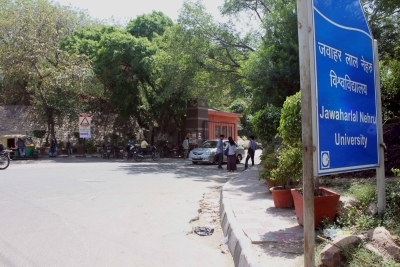 But the student body of Jawaharlal Nehru University, governed by Leftist parties, refused to trust the findings of the Commission. “It’s not just Hyderabad University, but in all the central universities that the Centre is engaging in manipulatory tactics. The report’s findings are stupid in that its outcome was predecided,” Amal P.P., Vice President, JNUSU, told IANS. He said that the Commission could not have been completely impartial for “it was mandated by the same agency (the HRD Ministry) which was a party to the controversy”. “Why is there no action against the ABVP student N. Susheel. Even in the JNU case, they accused us of raising anti-national slogans. Videos which were claimed to have captured those slogans later turned out to be doctored… there is no justice for Najeeb even after one year of his going missing… Is this the justice of ‘Sangh Parivaar’,” he asked. Refusing to buy the Commission’s finding that Vemula was not a Dalit, JNUSU President Mohit Pandey said the government has turned into a Dalit “manufacturing factory”. He also demanded an independent judicial probe in the matter. “It’s upto them who they want to pose as Dalit and who they do not,” he told IANS over phone referring to the newly-elected President of the country Ram Nath Kovind. The Commission, headed by Allahabad High Court judge (retd.) A.K. Roopanwal, submitted its findings to the HRD Ministry in December 2016, which was made public on Tuesday. It was constituted after Vemula’s suicide last year which triggered protests in the Hyderabad University and elsewhere, in which he was portrayed as an iconic victim of discrimination against Dalits. Vemula was among the four students, who had been barred from accessing the hostel premises and other public spaces within the university as a proctorial inquiry punishment in August 2015, for abusing and beating up ABVP activist N. Susheel Kumar over a Facebook post. He committed suicide on January 17 by hanging himself with an Ambedkar Students’ Association (ASA) banner.